IndiTatva brings the luxurious hand woven and handcrafted goods from the artisans across the Indian States and curates to match the eclectic style. IndiTatva deals with products like saree, Apparels, Fabric, jewellery, fashion accessories. IndiTatva was launched a couple of weeks back. 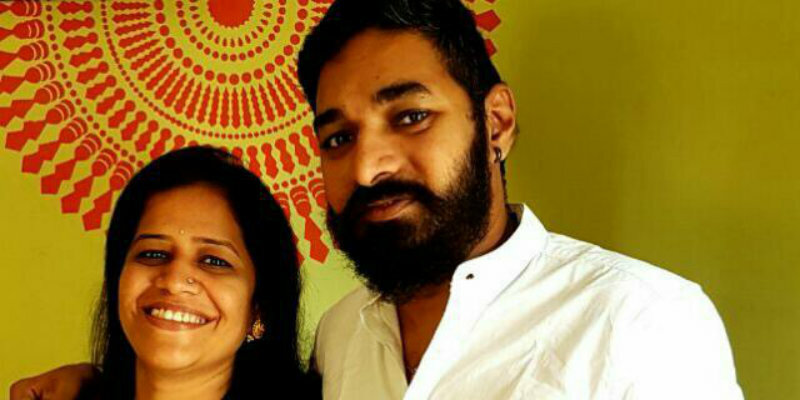 Swapnil and Deepti (Founders) have an educational and professional background that is not even remotely related to the venture that they have started with except for the digital platform and the branding part. For them bringing the whole idea to reality was an exciting ride and the key challenge was to identify the different art forms of India and reaching out to the artisans. Though there are a few societies that work with these artists, majority of this sector is unorganized. They are mostly based in rural or semi-rural areas, due to which things like transport, payment transfer that we would otherwise take for granted pose as big challenges, e.g a few of the artists don’t carry a phone and still rely on a care-of number, so at times, to speak to them founders had to wait for days trying persistently. Every set of challenges required a different approach, though their main outlook has been to instill trust in the artisans, talking to them and understanding their level of comfort to be able to cope up better. Currently Swapnil and Deepti are spearheading this venture, with a small team of really talented designers who share their vision. For Founders it was not that difficult to convince the team as it’s in line with the Make in India initiative and sustainable fashion. Also Founders have a desire to give back to the society and work with artists who are still practicing certain crafts and skills that are rare so that they sustain the changing times. Swapnil – He is a digital strategist who is always on the lookout for finding viable solutions that can convert great ideas into executed reality. With 16 years in the industry as a Creative Strategist, have worked with many interesting teams on various exciting clients like Incredible India, Accenture, Audi India, Suzlon Intranet, Tata Communications, Zoya – A Tata Product, Singapore Zoo, Tibco, Citibank, ICICIPru, CRY, Jeeves to name a few. Deepti Kshirsagar – is an Art Graduate from Sophia polytechnic Mumbai and has been working in the Design And branding industry from last two decades. She has been the founder of WOW Design, a strategic branding and design firm based in Mumbai. Born in a Maharastrian family that settled near a sea-side village dominated by fisher folks shaped her life with an interesting cultural parody. In spite of residing in a village, her parents were purveyor of a simple yet culturally rich lifestyle that included great exposure to good music, theatre, art and a lot of travelling across India. While her neighborhood homes smelled of fresh fish, her quaint house in the village was a place of intrigue to many as it housed local handicrafts, handmade goods brought from various place visited. So while being surrounded by the boisterous koli (fishermen) folk, on the other hand seeds of grounded handcrafted goodness were being sown subconsciously in her mind. This background led to her further education in art albeit with much struggle to complete it and thus landed her in to the fascinating world of art and design. “There are many players getting into the similar offering but if anyone looks at it as a movement to revive the Indian Handloom and handicraft industry, the more the players the better. Coming to the point of differention, founder’s vision is to take the handloom to the boardroom so while similar craft may feature on any other site, it’s the creating or the styling section that IndiTatva will differ” says Swapnil. Founders are currently working on line of product and services in alignment to their vision, they will be soon up. Team plans to launch products and services in alignment to the larger vision that will bring the handloom and handicraft into mainstream. To scale up to a level where they not only provide fair trade opportunities to the artisans but are able to take necessary steps towards enabling them to sustain and grow in their skills progressively. Read about Indian Startups.